Mr. Kirk. What an honor to meet you in print sir. You've got a great list sir. 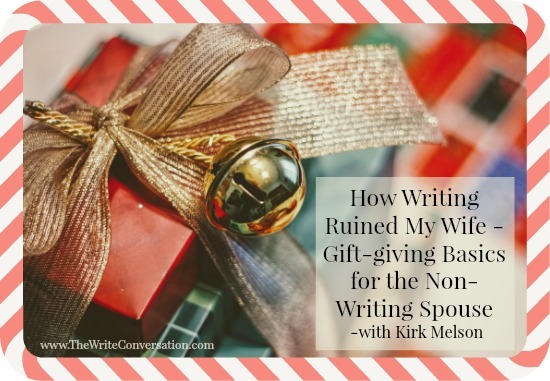 I could add two items to your list that I wish my non-writing or writing spouse could give each other. Prayer and time. Praying for your writer for things like inspiration, clarity, and insight is always special. The other would be a gift of time. I am blessed to be married to a "Creative", and the best gift I can give her is time to be creative. I make dinner, do laundry, shop, or any number of other things that free her to be creative. In fact, that's a gift we can give each other. Merry CHRISTmas Mr. Kirk and God's blessings sir. Kirk. Thank you for understanding your wife, we love her too. This is a great article I'm tweeting it. Have a very Merry Christmas and give your wife a hug from me. Trust me, not all writing love e-readers. I asked Santa for one of those tree-shaped bookshelf. It's fun to "see" you here on the page, Kirk! Merry Christmas to you and your amazing bride! Well said, Kirk. Thanks for giving voice to our wish lists. And I agree with Jim. Time, prayer, and well-timed words of encouragement are the greatest gifts of all. Merry Christmas!